The recently instilled price control on bottled water seems like a positive for all consumers. How can a lower priced good hurt society? A recent report by the Advocata Institute ‘Price Controls in Sri Lanka1’ finds that price controls are of limited value in reducing costs. The report claims that price controls can cause significant welfare losses, deterioration in product quality, reduction in investment and, in the long run, higher prices. Hence, one must approach production and economic fundamentals to observe price controls’ potentially detrimental outcomes. 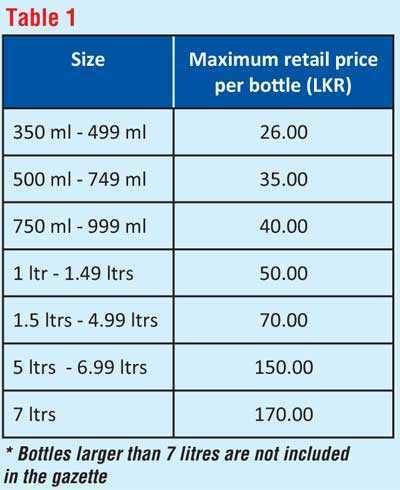 As per the extraordinary gazette notification2 released by the Government on 5 October, the maximum retail prices of bottled water is seen in table 1. As shown (table), the new ceiling prices shave off a fair chunk of the bottled water seller’s margin (for instance, the cheapest common 500ml brand retailed at Rs. 45). This falling margin trickles down from the retailer/wholesaler to the distributor and eventually the producer (bottler). As with any economic activity, the goal is to generate profit. This aim remains with the producer to the retailer, and a ceiling price disrupts economic activity. We must observe how this industry operates. The finished water bottles then make their way to wholesalers or retailers, to be purchased in large quantities (for events or corporates) or shelved at boutiques and supermarkets. This is done with the help of distributors, who range from large corporate in-house logistics departments, to the DIMO Batta owners outstation. This price control lowers the distributor’s margin, potentially removing the smaller distributors altogether. The larger sellers, like Keells with ‘K Choice’ water or Cargills’ ‘KIST Knuckles’, vertically integrate the entire process. It will no longer be in the interest of these supermarket oligopolies, to use up shelf space for rival brands (this is already apparent in some Keells outlets) and eventually the consumer suffers with few to no brand alternative. The price ceiling acts as a barrier to entry for new producers, as now they do not have the freedom to charge prices in line with economic forces. Existing producers may be forced out of the market or absorbed by larger entities. In economic terms, consumer choice falls. Lower priced bottled water leads to higher demand and consumption. This does not bode well for the environment, owing to more plastic use and waste. Sri Lanka annually imports 9,600 tonnes3 of raw virgin plastic (PET) to manufacture bottles, packaging and for other requirements. 70% of this is processed and consumed as an end product in Sri Lanka and the used plastic waste creates monstrous environmental issues. Although recyclers are trying to address this issue, the price control in question could severely contribute to even greater plastic waste. 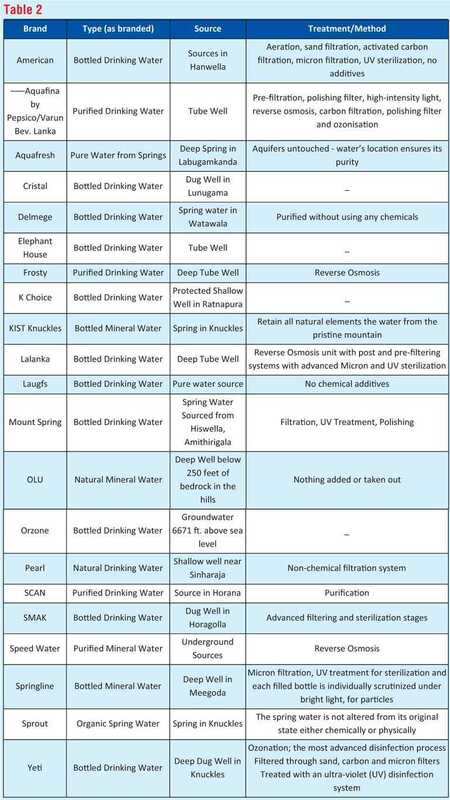 These bottles contain drinking water that was sourced differently. It was then processed (filtered/purified) differently. The plastic it is contained in is not standardised (it just has to fulfil a minimum health and quality requirement). These aspects of a seemingly simple good exposes variety with differentiability, and this may sway demand for one brand over the other. This should influence price and create a variation of prices for different brands, at the stimulus of consumer choice. However, in essence, this price control has homogenised a differentiable good. The consumer now pays one price across a range of bottled water. The price ceiling, although seemingly to help us buy cheaper bottled water, could cycle back to hinder the bottled water industry from giving the end consumer the best possible product. Water is not a scarce good (yet) in Sri Lanka and there are plenty of existing alternatives to bottled water. Has the government truly taken this into consideration? How have the new prices been calculated? What research has been carried out? Has a cost benefit analysis been performed? If so, where is it? Where is the data? Despite multiple attempts to communicate with senior employees at the CAA4, we failed to gather any meaningful answers, useful information nor a compliant contact. Why does the CAA pass the buck to its ministry who in turn has no one willing to answer these queries? Does society truly benefit from this seemingly positive, yet irrational gazette? Who really stands to benefit from this decision in the long run?